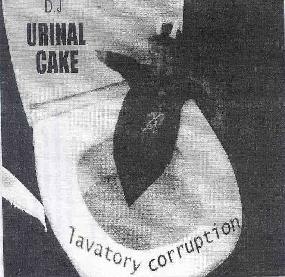 DJ Urinal Cake - "Lavatory Consumption" (Subversive Records 2001) buMscUzz - "And/Or Stuff"
Here we have two new side projects from members of Australia's masters of mayhem, Vocabularinist. The DJ Urinal Cake CD is a non-stop parade of good fun chaos that is clearly from the Vocabularinist point of view. Very much a studio crafted set of mindfucked braincandy, the music and sounds blaze along like a game of Asteroids on potent LSD. The guns are blazing, and every destroyed ship is flushed down the toilet. Simple keyboards and a slew of samples are meticulously cuisinarted to produce a set of carefully considered anarchy. Cosmic, hyper-kinetic DJ mixes that would liven up a dance party, though attempts at dance will surely result in injury. In addition to the frenzy there are several dark and intense ambient pieces with scary voices that produce an intriguing soundtrack feel, though the ambience is typically surrounded by a variety of hyperactive percussives and freaky synths. There are lots of spacey moments on the CD though they include the collage styled craziness I quickly grew accustomed to on the disc. There's also an experimental edge to the music though not in the abstract sense. Overall, this is a fine set of imaginative mixes that Vocabularinist fans are sure to enjoy. And if you haven't heard of Vocabularinist than note that this is very much along the lines of Vas Deferens Organization or even the Residents. Good sound party fun. Equally wild is the And/Or Stuff CD by buMscUzz. The electronics are mixed in a crazed style similar to DJ Urinal Cake, though the overall sound is a bit more simplistic. Among the highlight tracks is "Bloody Piano Scoops", which consists of simple keyboard melodies and electronic percussion plus strange animal sounds and voice samples. "Fuchenhausen" is similar but even freakier and with a spacey edge. "Another Sad Arse Story" is very much along the lines of Vas Deferens Organization's zany studio collage brand of psychedelia, though Bumscuzz has that DJ mixed sound. Ditto for "Creatalyst", "More Bonus Meat", and "The Storm Before The Calm" - Similar. "Phukyayaphukn Phuka" is a fun tune that feels like we're at a cosmic sock hop and has loads of very cool spaced out synths. "Season Finale" features a combination of electro industrial grind, quirky keyboard melodies with a surreal pop sound, and spaced out freaky synths. 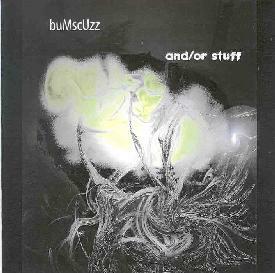 "Badness Iz Goodness Me" must be Bumscuzz's idea of a zany pop sensibility. It sounds like Devo gone noise-core doing "Louie Louie". And "A Burden Inheritance" is probably my favorite track on the CD, having a jazzy film soundtrack intensity, but also a sitar sound that adds a trippy touch to the music. In summary, Bumscuzz and DJ Urinal Cake get equal marks for outrageous creativity, though the DJ won out for this listener. Still, Vocabularinist fans should check out both discs for sure as there's lots on each to liven the party that shuns the traditional DJ in favor truly alternative psycho-delic mixes. For more information you can visit the Subversive web site at: http://subversive.itgo.com/. Hear songs from DJ Urinal Cake at his Mp3.com web site at: http://artists.mp3s.com/artists/160/dj_urinal_cake.html, and by Bumscuzz at his Mp3.com web site at: http://artists.mp3s.com/artists/319/bumscuzz.html.